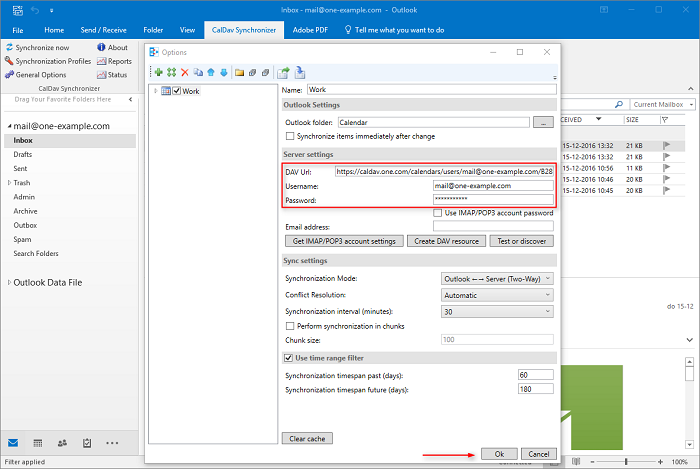 Note: You can't use the CalDAV Synchronizer in combination with Mobile Sync (Exchange ActiveSync), on the same email account. Mobile Sync already syncs your primary calendar automatically. 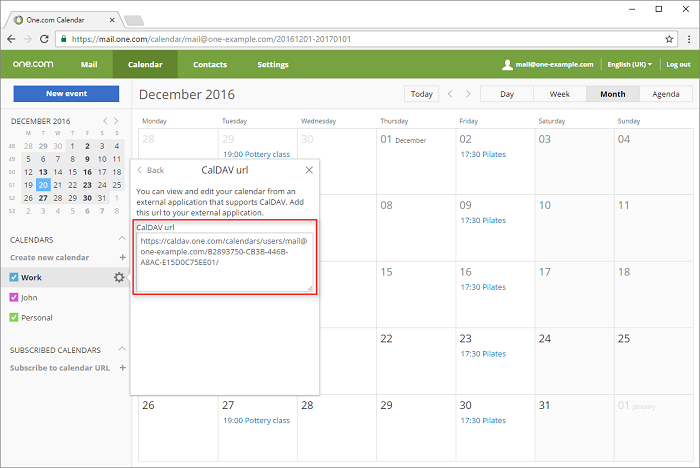 If you want to synchronize more than one calendar, we recommend setting up your account with IMAP in combination with CalDAV Synchronizer. 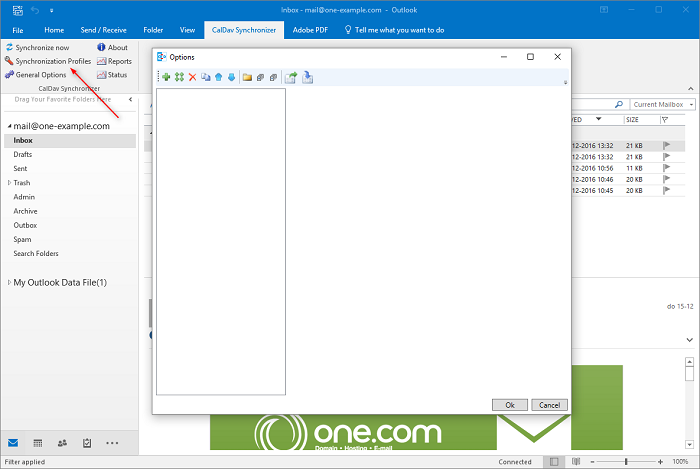 To sync your Webmail calendar in Outlook you need to download and install the extension Outlook CalDav Synchronizer. After you have installed it on your computer, you need to restart Outlook. 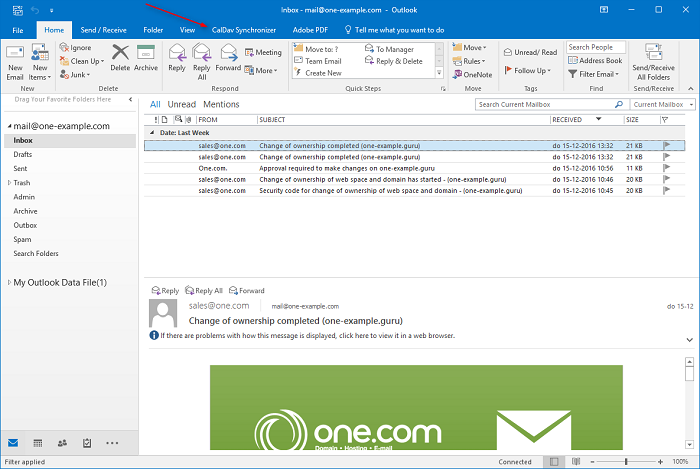 The extension will then be visible in Outlook as a tab in the blue ribbon at the top. 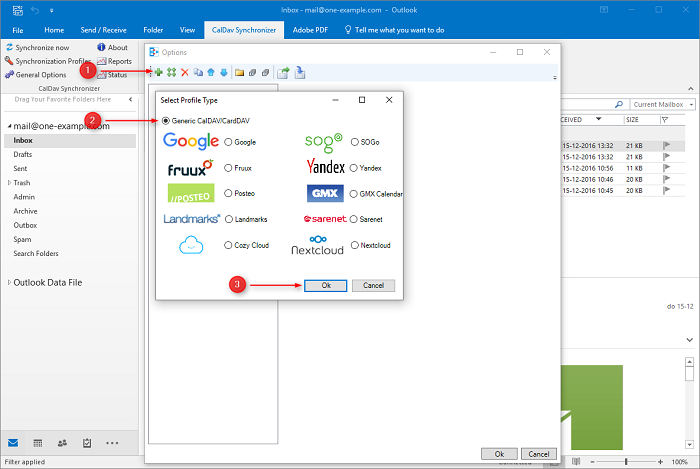 Note: Both Outlook and the CalDav Synchronizer extension are third party products. This means that One.com has no control over any changes or updates, that may cause it to stop functioning. To set up your calendar, you need the CalDAV url of your calendar. Log in to Webmail and go to Calendar. Click on the gear icon next to the calendar you want to sync, to open Settings. Click Show CalDAV url and copy the link. 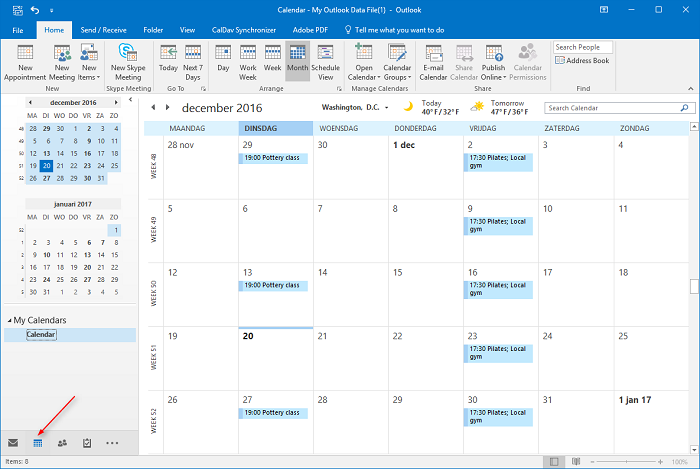 Open Outlook and click the tab CalDav Synchronizer, at the top of your screen. Click Synchronization Profiles to start setting up your calendar. Now you need to create a profile for your Webmail calendar. Click the green + icon in the top left corner. Select Generic CalDAV/CardDav as a profile type. Start by entering a name for your profile. Next you need to select the folder where the calendar will be saved on your computer. Click the ... behind the input field for Outlook folder. Select the Calendar folder under your Outlook Data File, or on your Exchange profile. Next you need to enter your server settings. DAV url: the URL you copied from Webmail earlier. Username: the email address where you created the calendar. Password: The password you use to log in to Webmail. Your calendar is now set up. 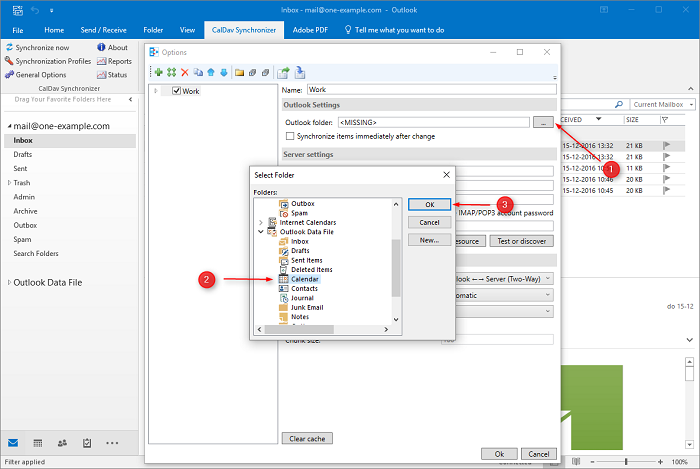 Any changes made in Outlook or Webmail will be synced automatically every 30 minutes. Go to the calendar section in Outlook to make sure that all your existing appointments have been synced correctly. How do I sync the calendar with my iPhone using CalDAV? How do I sync the calendar with my Mac using CalDAV? How can I share a calendar? How do I create an event in the calendar?